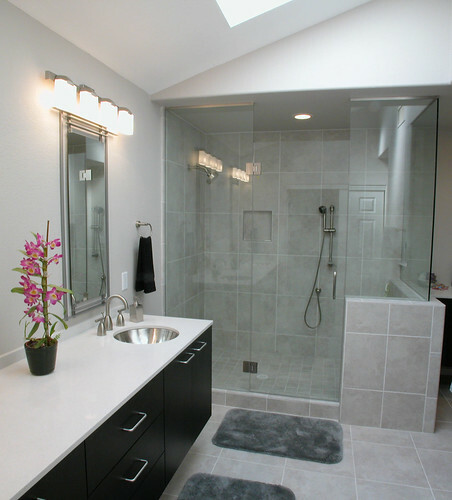 Before the total remodel of this home, the bathroom had a shower and separate tub which crowded the area. The tub was removed and the shower was enlarged to include a bench tucked behind the short wall and 2 shower heads on slider bars. The shower tile and floor tile are the same size and pattern. The glass enclosure is frameless so as not to interrupt the clean, open look. The vanity cabinet is wall hung 12" above the floor.